We all know that planning a wedding can be stressful. Imagine the frustration of sending out multiple enquiries to suppliers and hearing nothing back. We wanted to offer a solution to this recurring problem in the wedding hair and makeup industry. Make Me Bridal is founded by Melissa Morris & her husband Ralph. Melissa is a wedding hair and make-up artist who has made-up over 200 brides for their special day! She discovered that a huge number of brides were feeling overwhelmed by their initial search for a great quality, local, bridal artist and they really needed a more dedicated tool to simplify the process. With an increasing number of happy couples tying the knot every year, great artists are in high demand and Brides To Be are having to book 18 months in advance. Chances are that many brides have never planned a wedding before, don’t know what to expect of the process, the timelines or where to start, and can end up having a little wedmin melt down. Many online directories that specialise in recommending wedding suppliers don’t really filter through the talent, they simply list the artists that pay to be listed. Surely every bride wants to know that when booking an artist there is an element of authentication, trust, a level of work quality, experience, and that all the 5 star reviews are real! After getting married herself and noticing first hand what a bride looks for in her suppliers, Melissa and her husband Ralph (a software developer who was up for the challenge) dedicate 2 years building Make Me Bridal to take on a fresh approach to help brides find the best hand-picked wedding hair and makeup artists and let them know which artists are available with just one quick enquiry form, for FREE! 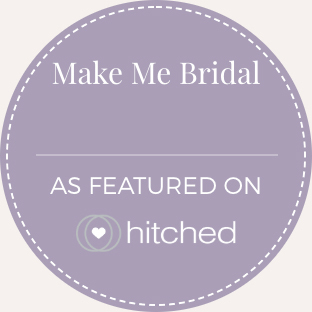 Make Me Bridal provides the bride a fun, easy search and book process, where they can view an artist’s profile, portfolio, price list, FAQ's and real reviews, they won't need to look elsewhere. As well as this, brides can get Makeup & Hair styling ideas by visiting the Inspiration Board which is regularly updated with images of real brides and editorial shoots from Make Me Bridal artists. Melissa and Ralph wanted to create a place that would also give the same satisfaction to the artists by creating a friendly and affordable workplace for them to promote themselves. A place to feel fully supported in their industry amongst a network of the top bridal artists in the U.K. Since their launch Make Me Bridal have partnered up with luxury hair & makeup brands such as Delilah cosmetics, Aurelia Skincare and My Kit Co, and unique wedding suppliers such as Wedition, who all have the end goal of ensuring top quality service and products to the brides of the future. With a network of over 250 hand-picked artists covering the U.K, Make Me Bridal has grown to become a ‘go to place’ for brides looking for the right artist to create their perfect wedding day look. Join the Make Me Bridal community today, as an artist or a Bride to Be.... creating happy faces!